Transforming a campus of historic buildings to create a safe and accessible cultural hub for Harrow Arts Centre. 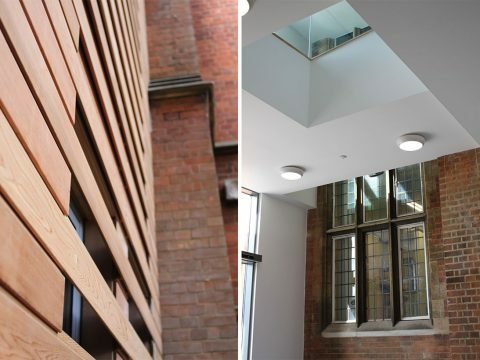 LOM have worked with Kier London to design and implement a series of interventions at Harrow Arts Centre, which occupies the historic campus of the Royal Commercial Travellers’ School in Hatch End, North London. The programme of work funded by the LSC aims to improve access, safety and the quality of learning facilities. A new flexible multipurpose building provides space for classes, lectures and community events, while a link structure provides a lift and level access between the listed Elliott Hall and the annexe housing teaching and rehearsal spaces. Using a simple palette of carefully selected matching brickwork together with cedar cladding, the new structures are contemporary whilst remaining sensitive to the historic context. Fast track construction enabled the works to be completed with minimal impact on the programme of activities at the Arts Centre which remained open throughout.